Clicking in the above link will automatically create a CloudSponge for your store, and now all public pages will be able to use our widget. At Pages, click on an existing page or add one clicking in the top right Add page button. Need help? Comments? Want to customize it? Let us know! If you want to provide Gmail importing for your customers, you’ll need to spend 2 minutes to configure a Google API Credential. After you follow these steps, your users will see your product name in the Google Authentication window. Important: Google requires you to submit a review of your application before they will allow strangers to use approve your OAuth permission requests. Google warns that the OAuth review may take up to a week. In our experience, the review may be faster than 24 hours as long as Google doesn’t have any questions about your application. We’ve prepared some background and directions to help you navigate the new process successfully. You can still test out your integration immediately. Obtain your Google OAuth 2.0 Credentials. Configure your CloudSponge account with your Google OAuth credentials. Request a review on Google’s OAuth Developer Verification Form. Watch how to create a Google OAuth credential in a few minutes. Sign into the Google Developer Console with your Google account. Create a new project, or click on an existing one. Ensure that the Contacts API is enabled for your project. Configure your consent screen with your product name and other details. Create a new credential for your project. Fill Authorized redirect URIs with your Proxy URL. Note your Client ID and Client Secret. You will enter these into CloudSponge. Click over your app credentials in order to view details. Take note of your Client ID, Client secret. 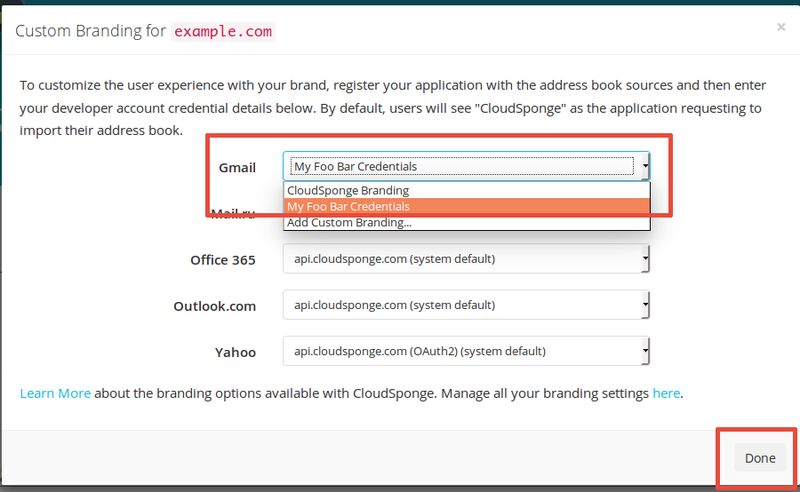 Sign in to your CloudSponge account and add a new Gmail OAuth Credential. Enter the Client ID, Client secret and Redirect URI values from Google and click on Save button. Test a Google import on your site. then your OAuth account needs to be reviewed before Google will let you request access to people’s address books. This is a new requirement that they introduced on May 11, 2017. We’ve prepared some background and directions for navigating the new review process. Read our background and directions for a quick turnaround from the review process.